In a recent press conference, Jeb Bush clumsily (and erroneously) said that the phenomenon of so-called "anchor babies" was "frankly, more related to Asian people." As others have noted, the phenomenon of birth tourism is distinct from most conventional understandings of the offensive term "anchor baby," which tends to imply that people use birthright citizenship from their children to avoid deportation or eventually gain U.S. citizenship for themselves. There has been a fair amount of sensationalist reporting on birth tourism by Chinese immigrants, with little understanding of the number of estimated "birth tourists," and how they compare to the overall number of Chinese immigrants or visitors to the United States. Below, we provide some numbers in perspective. Estimates of birth tourists are inherently difficult to come by, because hospitals do not inquire on the visa status of mothers, and tracking outmigration from the United States by visa category is not possible. Still, the conservative Center for Immigration Studies estimates the total number of birth tourists from around the world to be about 36,000 per year, while other sources indicate the annual number of Chinese birth tourists to be around 20,000. 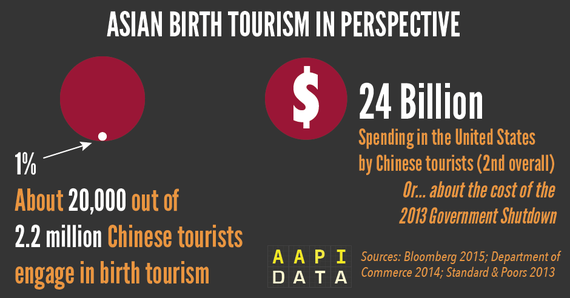 To put those numbers into perspective, Chinese birth tourists account for about 1% of all Chinese tourists visiting the United States, who numbered around 2.2 million in 2014. Chinese tourism is also a major part of total international tourism spending in the United States, accounting for $24 billion in tourism spending, according to the Department of Commerce, and second only to Canadian tourists who spent around $27 billion. The federal government has already cracked down significantly on birth tourism establishments, with evidence suggesting that the overall numbers of birth tourists from China may be in decline. Targeting individuals who may be intending to engage in birth tourism is not only likely to invoke concerns about racial profiling and violations of privacy, it also puts at risk a robust and growing trend in Chinese tourism to the United States, which is expected to reach $81 billion in spending by 2021.